(Nanowerk News) Jülich scientists have developed a new control technique for scanning probe microscopes that enables the user to manipulate large single molecules interactively using their hands. Until now, only simple and inflexibly programmed movements were possible. To test their method, the researchers "stencilled" a word into a molecular monolayer by removing 47 molecules. The process opens up new possibilities for the construction of molecular transistors and other nanocomponents. The findings have been published in the Beilstein Journal of Nanotechnology ("Patterning a hydrogen-bonded molecular monolayer with a hand-controlled scanning probe microscope"). "The technique makes it possible for the first time to remove large organic molecules from associated structures and place them elsewhere in a controlled manner," explains Dr. Ruslan Temirov from Jülich's Peter Grünberg Institute. This brings the scientists one step closer to finding a technology that will enable single molecules to be freely assembled to form complex structures. 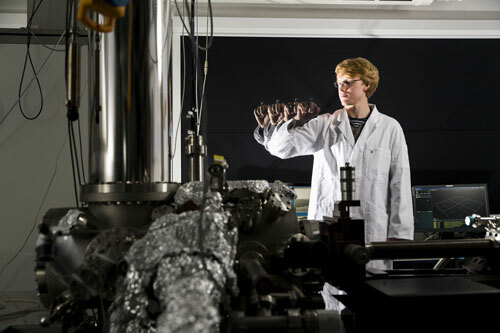 Research groups around the world are working on a modular system like this for nanotechnology, which is considered imperative for the development of novel, next-generation electronic components. Using motion tracking, Temirov's young investigators group coupled the movements of an operator's hand directly to the scanning probe microscope. The tip of this microscope can be used to lift molecules and re-deposit them, much like a crane. With a magnification of five hundred million to one, the relatively crude human movements are transferred to atomic dimensions. "A hand motion of five centimetres causes the sharp tip of the scanning probe microscope to move just one angstrom over the specimen. This corresponds to the typical magnitude of atomic radii and bond lengths in molecules," explains Ruslan Temirov. Controlling the system in this way, however, requires some practice. "The first few attempts to remove a molecule took 40 minutes. Towards the end we needed only around 10 minutes," says Matthew Green. 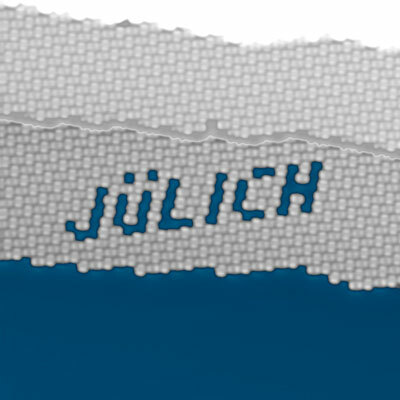 It took the PhD student four days in total to remove 47 molecules and thus stencil the word "JÜLICH" into a perylenetetracarboxylic acid dianhydride (PTCDA) monolayer. PTCDA is an organic semiconductor that plays an important role in the development of organic electronics – a field that makes it possible to print flexible components or cheap disposable chips, for example, which is inconceivable with conventional silicon technology. Small spelling mistakes can even be corrected without difficulty using the new method. A molecule removed by mistake when creating the horizontal line in "H" was easily replaced by Green using a new molecule that he removed from the edge of the layer. "And exactly this is the advantage of this method. The experimenter can intervene in the process and find a solution if a molecule is accidentally removed or if it unexpectedly jumps back to its original position," says the physicist. The interactive approach makes it possible to manipulate molecules that are part of large associated structures in a controlled manner. In contrast to single atoms and molecules, the manipulation of which using scanning probe microscopes has long been routine, larger molecular assemblies were almost impossible to manipulate in a targeted manner until now. The reason for this is that the bonding forces of the molecules, which are bound to all of the surrounding neighbouring molecules, are almost impossible to predict exactly. Only during the experiment it becomes clear what force is required to lift a molecule and via what path it can be successfully removed. The experience gained will help to speed up time-consuming operations. 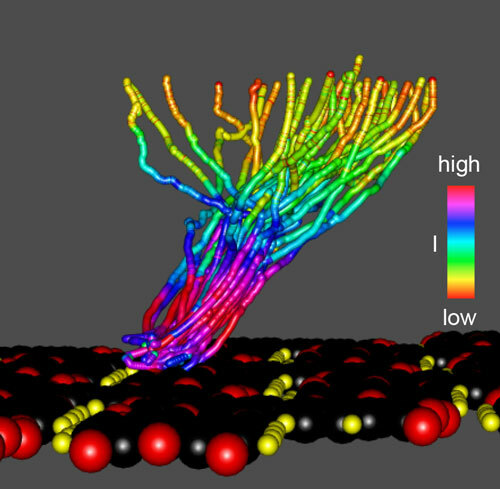 "In future, self-learning computers will take over complex molecule manipulation. We are now gaining the intuition for nanomechanics that is so essential for this project using our novel control system and quite literally by hand," says Dr. Christian Wagner, who is also part of the Jülich group.